The sad news is coming out of Bangkok that actor David Carradine is dead at the age of 72, having apparently took his own life. Carradine's most iconic role was no doubt as Kwai Chang Caine in the 1970s television show Kung Fu (and as Caine's descendant of the same name in the Nineties series Kung Fu: The Legend Continues). 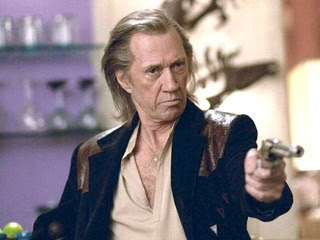 More recently Carradine found new acclaim when he portrayed sadistic assassin Bill in Quentin Tarantino's Kill Bill. Carradine's resume was profound but if you really want to see him shine across his spectrum of acting abilities, I'd suggest watching him as Frankenstein in Roger Corman's Death Race 2000: one of the most fun guilty pleasures of a movie you'll ever find.